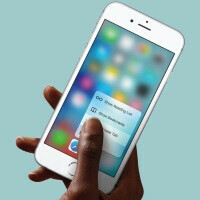 The 3D Touch built into the new iPhone 6s and 6s Plus is one of the most useful user experience additions that iOS has gotten over the course of its existence. Basically, 3D Touch enables two new gestures across the system: Peek and Pop. Peek corresponds to a slight press on the screen, while Pop is engaged when the user presses harder. Both cause various useful shortcuts, contextually related to the app, to appear on the Home screen. You may not know it, but clever app developers were quick to catch up with Apple's new functionality and introduce useful 3D Touch gestures to their applications. We will now present you 10 popular apps that got a dose of the 3D Touch fun mere days after (or, in fact, the very same day!) the new iPhone 6s and iPhone 6s Plus launched. Instagram now lets users access many features from the Home screen with 3D Touch shortcuts. You can launch Quick Actions to post a new photo, check out your activity and notifications, search for photos, and send a photo message. You can also 3D Touch on a profile link to get a Peek preview of the user profile. Or lift up from a Peek to follow a user or like a photo. With 3D Touch enabled, the Dropbox app icon on the Home screen lets you access new Quick Action shortcuts, such as file search, Dropbox photo upload, view offline files or any files you’ve recently added. You can also use 3D Touch inside the app to Peek into files and folders. Try it! Popular instant messaging app WeChat supports 3D Touch for activating Quick Actions right from the Home screen. It lets you access and share your QR code to chat with friends, record a short video, or start a new chat. 3D Touch makes it easy to breeze through all of Evernote's notes. The Quick Actions available from the Home screen include starting a new note, taking a photo, and setting a reminder. Meanwhile, 3D Touch features available inside the app include peeking into links and getting a preview of notes from your Evernote home screen. Twitter was actually among the first third-party apps to embrace 3D Touch, as it was updated with support for the feature the very same day that the iPhone 6s started shipping. Thus, you can use 3D Touch on the Twitter icon to search through your feed, start a tweet, or send a message. Song recognition with Shazam just got outfitted with 3D Touch. The Quick Actions enabled by deep presses let you search for a song right from your Home screen, saving you at least one tap. The feature works by deep pressing the Home icon, which tells Shazam to start listening or take a photo for visual song recognition. The latest version of Pinterest lets you 'Peek' and 'Pop' into pins with 3D Touch in the latest version of Pinterest. This happens inside the app, though. And from the Home screen, you can launch several Quick Actions. By 3D-touching the Pinterest icon, you can check out trending pins, search for new ones, and create a new board. Spark is an email app that utilizes 3D Touch-enabled Peek and Pop for inbox navigation. Spark also sports a new set of Quick Actions that you can launch right from the Home screen — you can view your calendar, check your attachments, search for a message, or start emails. Hipstamatic supports 3D Touch-enabled Quick Actions related to the photo app’s various shooting modes. For example, the Shoot Sunset Quick Action definitely should come in handy when you want to, you know, capture the sunset. Other shooting modes available include ones specialized for food and selfies. Sharing your favorite GIF got an infusion of 3D Touch with the gesture-enabled version of GIF Keyboard. You can deep press on the app icon from the Home screen to launch a Quick Action, such as GIF search, uploading a GIF from your camera roll, or sending a GIF via Messages. When Apple does something new, it works the way it should. If there are quirks they are fixed very quickly. When Samsung adds a new gimmick it never works the way it should. If it is something the user wants, and is excited for the update to fix it? Well, you're going to have to buy the next generation s phone for that. Apple success keeps android fanboys awake at night, that makes me giggle. Multi window, popup video, and floating windows were all gimmicks, that not only worked right, but are being copied. You are talking about first party features, and this article is about third party supports. That's a huge difference. Oh see.!. BobbyBuster Talks !!!!! thank you... leave aside trolling & hating, you'll see those feature of what android or iOS offered was meant to help their user. True that. Remember Apple Maps? This is why Samsung MUST use Tizen in their future flagship devices(when fully developed ofc)! That way apps can utilize better their innovations. With android they must wait till every other android OEM catches up! That is a post of the day. I would love a big platform contender to enter the market and Samsung is probably the only mfgr that can do it. I hate that BB is on the way out, and Windows isn't envited to the party most of the time (I hate that too). Why does android have to eat up everything. Thank you, but it was a rhetorical question. But since we're in the subject: I think it's lazy that manufacturers are just smooching on freeware. If it wasn't for Apple, we'd literally have no choice.